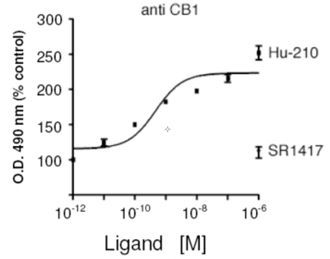 Immunogen: Synthetic peptide corresponding to the sequence near the N-terminus of mouse cannabinoid receptor CB1. Crossreactivity: Predicted species reactivity based on epitope sequence homology: gorilla, guinea pig, horse, dog, cat, platypus, Zebra Finch (bird). Application Notes: Suitable for cell-based and membrane-based ELISA. Predicted MW of ~53kDa. 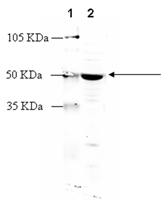 Higher MW species may also be observed by Western blot which reflect post-translational modification of the receptor. Formulation: Liquid. In PBS containing 50% glycerol and 0.01% sodium azide. Handling: Keep on ice at all times. Scientific Background: The cannabinoid receptors CB1 and CB2 are GPCRs named for their signaling function in response to cannabinoid drugs such as Delta9-tetrahydrocannabinol (Delta9-THC). In addition to Delta9-THC and its synthetic analogs, CB1 and CB2 receptors are bound by endogenous eicosanoid ligands (e.g. anandamide), and signal via Gi/o alpha subunits to regulate adenylyl cyclase activity (generally inhibitory), ion channel activation, intracellular Ca2+ levels, nitric oxide synthase activation, and immediate early gene expression. CB1 and CB2 signals in turn regulate neurological and immunological functions such as inhibition of neurotransmitter release and immune cell migration, antigen processing, and cytokine production. Western blot analysis: MW Marker (1) and 10µg of rat brain membrane extract (2) probed with Cannabinoid Receptor (CB1) pAb at 2.8µg/ml. Membrane ELISA: Lewis rat striatum membranes (5µg/well) were treated with 1 μM concentrations of agonist (HU210) and Inverse agonist (SR141716A/Hemopressin) and probed with Cannabinoid Receptor (CB1) pAb (1:1000 of a 1µg/μl stock solution) by ELISA. Data from vehicle treated cells were taken as 100%. Results are the mean ± SEM (n=2). 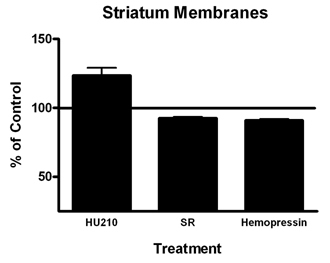 Membrane ELISA: Membranes (5µg) from rat striatum were treated with indicated concentrations of agonists (HU-210) and inverse agonist (SR141716A) and probed with Cannabinoid Receptor (CB1) pAb by ELISA. Data from vehicle treated cells were taken as 100%. Results are the mean ± SEM (n=3).